Choosing cheaper cuts of meat is one of the most basic ways to save money on groceries. 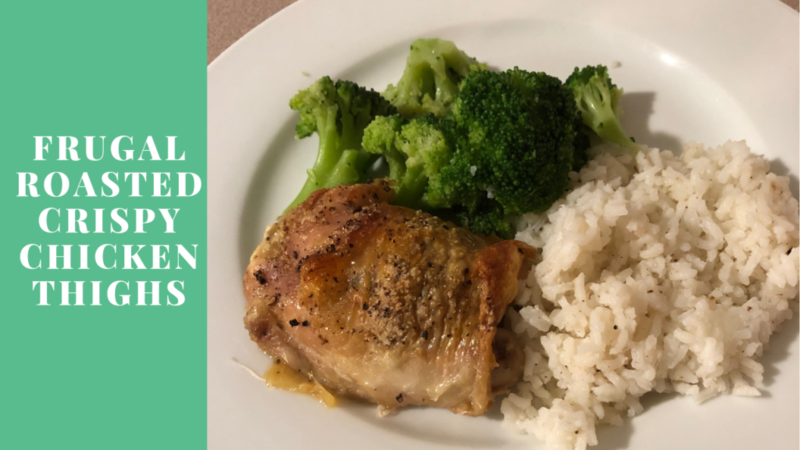 A long time ago I began to buy boneless, skinless chicken thighs more than chicken breasts, mostly because the flavor is better, but thighs are also cheaper than breasts! If you buy chicken thighs that are bone-in and skin-on, though, you’ll save even more money. I recently saw bone-in, skin-on chicken thighs for $0.69 per lb! Even better, this recipe for crispy roasted chicken thighs is a family favorite! One of my favorite bloggers/podcasters to follow is the Lazy Genius, who has a recipe she calls “Change Your Life” Chicken that is very similar, only she has great instructions for adding veggies with the chicken. I actually made it her way recently because of all the rave reviews and realized it’s essentially the same kind of idea, I just sear my chicken in the pan first. Peel back the skin on each chicken thigh and spread salt and pepper under the skin. Use a paper towel folded over to pat the skins dry. Then sprinkle more salt and pepper on top of the skin. Heat the olive oil in a large skillet over medium-high heat. Once the oil is hot, place the chicken thighs skin-side down in the skillet and leave them for 3-4 minutes. Take the thighs out and place them on the pan/dish, skin side up. Place the pan in the oven and bake the thighs for 30-40 minutes, until the juice runs clean (or use a meat thermometer to check like I do!). I like to serve this with sides that are quick and easy and don’t require the oven, like rice in the rice cooker and a frozen vegetable cooked in the microwave. 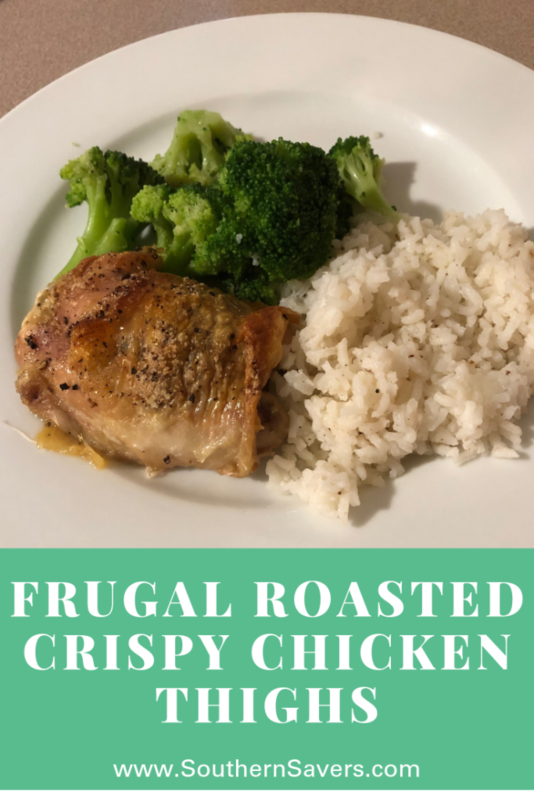 My kids love these roasted chicken thighs so much—some don’t love the skin, but there’s always someone else willing to eat that crispy goodness. Another bonus is that these roasted chicken thighs are paleo-friendly, keto, and gluten-free! You can also make this with different seasonings—try adding some spice with a bit of cayenne pepper, or add herbs like thyme or rosemary in addition to the salt and pepper.